Former Prime Minister Lester B. Pearson’s idea for a neutral military force, to help stabilize conflict zones, earned him the Nobel Prize. Most Canadians now regard peacekeeping as uniquely ours. I have always had an interest in graphic design. My first career was as a graphic artist and typesetter. I eventually found my way into art history, teaching and now archival work. Although I work primarily with textual documents these days, I am frequently delighted by the array of aesthetically pleasing items in LAC’s collection. 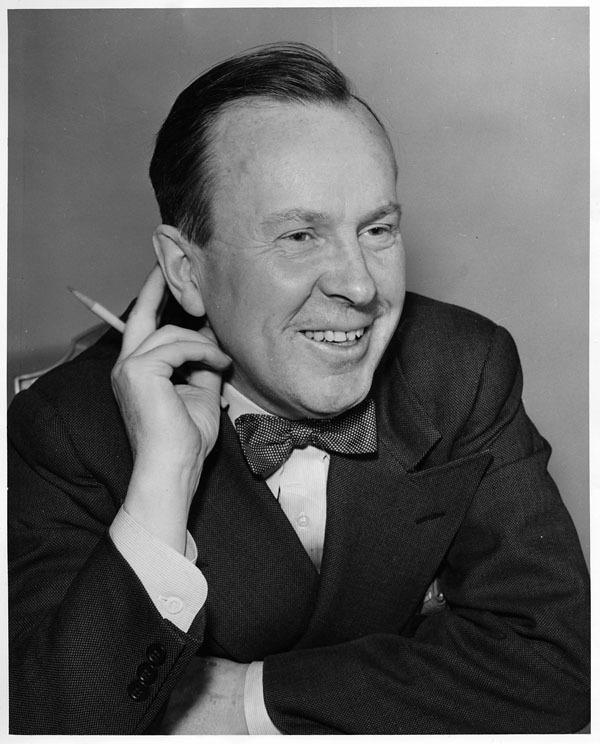 Lester B. Pearson won the Nobel Prize for his role in negotiating a peaceful resolution to the 1956 Suez Canal Crisis. The crisis erupted when Egyptian President Gamel Abdel Nasser seized and nationalized the Suez Canal (then jointly owned by France and Great Britain), a move that threatened the supply of oil to Europe. In retaliation, France, Great Britain and Israel secretly collaborated to attack the Sinai Peninsula. The United States and the Soviet Union subsequently became embroiled in the conflict, with the Soviet Union threatening to use nuclear weapons against the assailants. 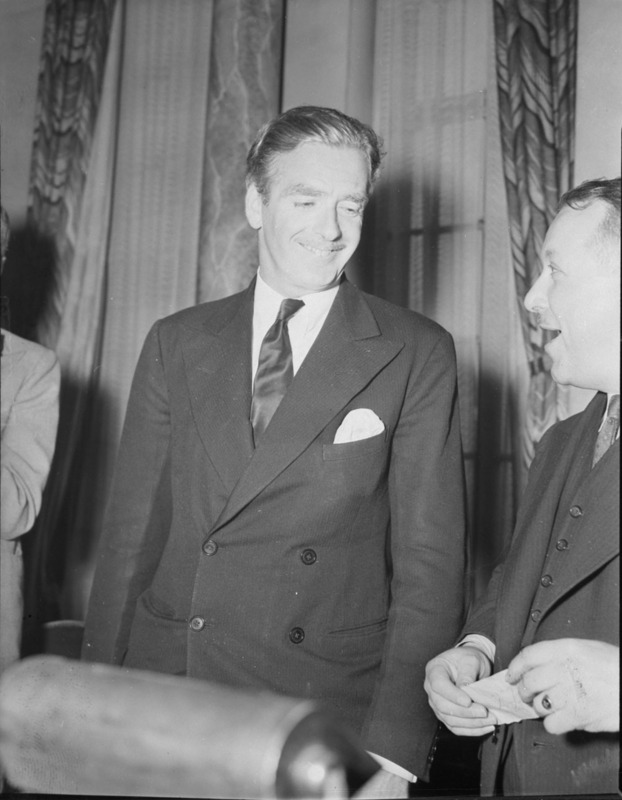 Pearson, at the time Secretary of State for External Affairs and head of Canada’s delegation at the United Nations, stepped in and helped establish the United Nations Emergency Force, which was instrumental in de-escalating the conflict. 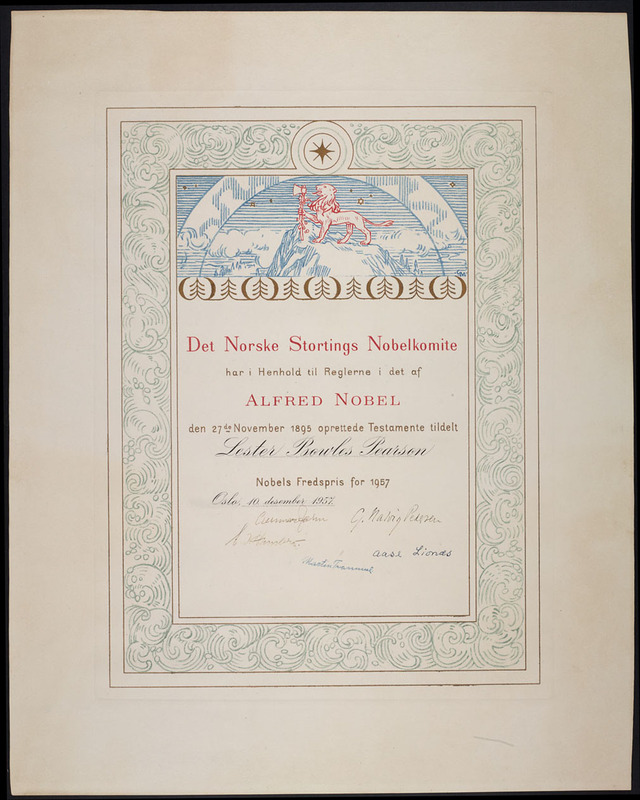 Although Pearson was awarded the Nobel Prize in 1957, the design of the certificate dates from the beginning of the 20th century. In addition to hand-drawn calligraphy, it features a lithograph designed by Gerhard Munthe in 1901, the year the Nobel Peace Prize was first awarded. A Norwegian painter, decorative artist and illustrator, Munthe took many of his artistic motifs from his native Norway. He worked in the National Romantic Style, the Scandinavian version of Art Nouveau in the late 19th and early 20th centuries. This style, which was a reaction against industrialism, promoted ideas of northern nationalism based on the renewal of interest in Norse mythology and sagas. The illustration at the top of the certificate shows a lion holding an axe, a symbol of power and courage that appeared in Norwegian folk art as far back as the 13th century. The motif also appears on the coat of arms of Norway. Atop a decorative frieze of stylized fir trees, the lion stands proudly in a wild northern landscape. Northern lights swirl above his head, and the image is surmounted by the North Star. Although the overall design is delicately rendered and restrained, it is nevertheless a powerfully evocative image. I was particularly struck by a photograph that shows Lester B. Pearson with another of the key players in the Suez Crisis: British Prime Minister Sir Anthony Eden. Duncan Cameron, an Ottawa photographer from Capital Press Limited (and the only Canadian contract photographer for Time Life Inc.), snapped the photo of Pearson and Eden outside the Parliament Buildings in Ottawa on February 6, 1956. Eden, who had known Pearson since the 1930s, was visiting Canada and had just given a speech to the House of Commons. A long-time politician known for his skill in public affairs, Eden succeeded Winston Churchill as prime minister of the United Kingdom in 1955. In the photograph, the two men appear relaxed and happy; there is no premonition that a rift would develop between Canada and Great Britain a few months later, after Eden collaborated with France and Israel to invade Egypt. While Pearson went on to win the Nobel Peace Prize, become Canada’s 14th prime minister, and gain a reputation for international diplomacy, Eden’s popularity took a nosedive, and as he was in ill health, he resigned in February 1957. Interesting side note: the photographer, Duncan Cameron, would eventually join the Public Archives of Canada, where he became Photo Custodian of the National Photographic Collection. LAC holds his fonds, which consists of 175,000 prints, negatives and slides. Katie Cholette is an archivist in the Governance and Political Archives section. She is currently working in the private military and non-LAC Act institutions areas. Katie has a BA in Art History, an MA in Canadian Art History, and a PhD in Canadian Studies. She has previously worked as the Curator of Acquisitions and Research and the Curator of Exhibitions at the Portrait Gallery of Canada (2007–2008; 2011), held two Research Fellowships in Canadian Art at the National Gallery of Canada (2006; 2012–2013), and taught courses in Art History and Canadian Studies and at the College of the Humanities at Carleton University (2003 to present). She has delivered papers and published articles on various aspects of art, architecture, culture and identity, and has worked on a number of freelance curatorial and research projects. As a student at Carleton, she was a regular patron of Mike’s Place, the graduate student pub named in Lester B. Pearson’s honour. This entry was posted in Exhibitions and tagged Canada150, Canada: Who do we think are?, exhibition, Lester B. Pearson, Lithography, Nobel Peace Prize, Photography by Library and Archives Canada Blog. Bookmark the permalink.